CIA Director Petraeus Resigns, Citing Extramarital Affair : The Two-Way Petraeus has been married for 37 years and said "such behavior is unacceptable." Petraeus retired from the Army as a four-star general to become the CIA chief in September of 2011. Former Central Intelligence Agency Director, David Petraeus, in Sept. 2011. The director of the Central Intelligence Agency David Petraeus submitted his resignation today, citing an extramarital affair. "After being married for over 37 years, I showed extremely poor judgment by engaging in an extramarital affair," Petraeus, 60, said in a message sent to CIA staff. "Such behavior is unacceptable, both as a husband and as the leader of an organization such as ours. This afternoon, the President graciously accepted my resignation." 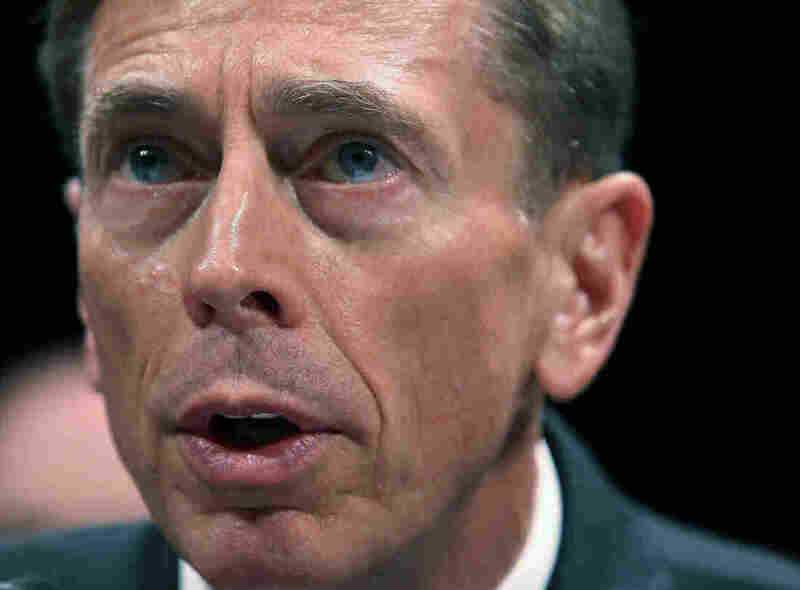 Petraeus retired from the Army as a celebrated four-star general, who had led forces in Iraq and Afghanistan. He retired in September 2011 to become the CIA chief. President Obama accepted his resignation saying that "by any measure, he was one of the outstanding General officers of his generation." The president added that Petraeus and his wife, Holly, were in his "thoughts and prayers" during "this difficult time." The president appointed Petraeus' deputy, Michael Morell, as acting director. This is a breaking news story. We'll update as soon as we have more. Many news organizations, including The New York Times, Washington Post and Wall Street Journal identified the woman Friday evening as Paula Broadwell, citing unnamed officials. Broadwell is a West Point graduate, who wrote a biography of Petraeus, published this year and titled All In: The Education of General David Petraeus. "We know from our own sources that evidence of this affair came up in the course of an FBI investigation, and in the course of that investigation, the investigators found, according to our sources, hundreds of — maybe thousands of — emails between Gen. Petraeus and this woman with whom he was having an affair. "That would certainly catch the Bureau's attention because it raises the possibility of someone getting unauthorized access to classified information. That could be a big security risk and it would be the FBI's responsibility to check into it." Bruce Riedel of the Brookings Institution, who served 30 years at the CIA, says other directors have been forced out of the agency "under unflattering" situations. One of them during the Clinton administration was forced out after a KGB mole was discovered. Another was forced to retire after he left classified material on his own laptop. But Riedel tells our Newscast unit this may be the first time a director resigns because of an affair. "There's a personal tragedy here, of course. But there's a larger tragedy for our country," he said. "David Petraeus was an American patriot and we don't have an abundance of patriots to lose. And his shoes will be hard to fill at the CIA." Riedel says there is no policy that forces a director out because of an affair. "It probably has more to do with the general's own sense of duty, honor and country," he said. As for the future, Riedel said the first name that comes to mind to take over as CIA director is John Brennan, President Obama's chief counterterrorism adviser. Petraeus did not provide any details about the affair. The New Yorker, however, says it brings up all kinds of questions. Was it with a subordinate? Could it have involved blackmail? Did it compromise national security? In a statement, Sen. John McCain (R-Ariz.) said Petraeus will "stand in the ranks of America's greatest military heroes." He added: "His inspirational leadership and his genius were directly responsible — after years of failure — for the success of the surge in Iraq." Sen. Dianne Feinstein (D-Calif.), the chairman of the Senate Intelligence Committee, said in a statement that she "regret[s] the resignation." "I wish President Obama had not accepted this resignation, but I understand and respect the decision," Feinstein said. Mark Knoller of CBS News reports that because of the news, Petraeus will not testify next week at the committee's "closed hearing on the events in Benghazi." The New York Times reports that the resignation came as a surprise to the national security community. Petraeus was expected to stay on the president's team through his second team. "Over the last several years, Mr. Petraeus had become one of the most recognizable military officials, serving as the public face of the war effort in Congress and on television. "Under President George W. Bush, Mr. Petraeus was credited for helping to develop and put in place the 'surge' in troops in Iraq that helped wind down the war in that country. Mr. Petraeus was moved to Afghanistan in 2010 after Mr. Obama fired General Stanley H. McChrystal over comments he made to a magazine reporter." In a statement, President Obama said his "thoughts and prayers" were with Petraeus and his wife, Holly, "who has done so much to help military families through her own work." Obama said that Petraeus has "provided extraordinary service" to the country. "By any measure, he was one of the outstanding General officers of his generation, helping our military adapt to new challenges, and leading our men and women in uniform through a remarkable period of service in Iraq and Afghanistan, where he helped our nation put those wars on a path to a responsible end," Obama said. "As Director of the Central Intelligence Agency, he has continued to serve with characteristic intellectual rigor, dedication, and patriotism. By any measure, through his lifetime of service David Petraeus has made our country safer and stronger." "He last served as Commander, NATO International Security Assistance Force and Commander, US Forces–Afghanistan from July 4, 2010 until July 18, 2011. His other four-star commands include assignments as the 10th Commander, United States Central Command, and as Commanding General, Multi-National Force-Iraq during the surge. "Prior to those assignments, Director Petraeus commanded the US Army Combined Arms Center and Fort Leavenworth during which time he oversaw development of the US Army/Marine Corps Counterinsurgency Field Manual; the Multi-National Security Transition Command-Iraq—and, simultaneously, the NATO Training Mission-Iraq—both of which he established; and the 101st Airborne Division (Air Assault)—including while the 101st participated in the fight to Baghdad and subsequent stability operation during the first year of Operation Iraqi Freedom." James R. Clapper, the director of National Intelligence, said in a statement that Petraeus' resignation "represents the loss of one of our nation's most respected public servants." Clapper added: "I'm particularly thankful for Dave's unwavering support and personal commitment to my efforts to lead the Intelligence Community and integrate our intelligence enterprise." In a statement sent to press, Petraeus says he resigned for personal reasons. "After being married for over 37 years, I showed extremely poor judgment by engaging in an extramarital affair," he said. "Such behavior is unacceptable, both as a husband and as the leader of an organization such as ours. This afternoon, the President graciously accepted my resignation."